Each week we will have a full list of the racing results from the previous weekend. Click on the name of the championship you wish to see the results of. SUPERSPORT: 1 J Brookes, Australia, 2 A Pitt, Australia (Honda), 3 J Rea, GB (Honda), 4 B Veneman, Holland (Suzuki), 5 H Kennaugh, South Africa, (Yamaha), 6 R Harms, Denmark (Honda), 7 J Lascorz, Spain (Honda), 8 D van Keymeulen, Belgium (Suzuki), 9 M Lagrive, France (Honda), 10 B Parkes, Australia (Yamaha), 11 G Vizziello, Italy (Honda), 12 E Laverty, Ireland (Yamaha), 13 M Aitchison, Australia (Triumph), 14 K Fujiwara, Japan (Kawasaki), 15 C Martin, GB (Kawasaki). British: 20 G Gowland (Honda). Championship points: 1 Pitt 169pts, 2 Brrookes 137, 3 Rea 133, 4 Parkes 119, 5 Jones 100, 6 Foret 97, 7 Lascorz 92, 8 Veneman 61, 9 Harms 60, 10 Roccoli 48. British: 14 Walker 36, 26 Froest 7, 28 Plater 5, 30 Laverty and Gowland 4, 33 Martin 1. SUPERSTOCK 1000: 1 X Simeon, Belgium (Suzuki), 2 A Polita, Italy (Ducati), 3 D Giugliano, Italy (Suzuki). British: 5 J Kirkham (Yamaha),9 B Burrell (Honda), 16 P Hickman (Yamaha). Championship points: 1 Roberts 122pts, 2 Simeon 120, 3 Berger 119. British: 12 Burrell 31, 21 Kirkham 11. 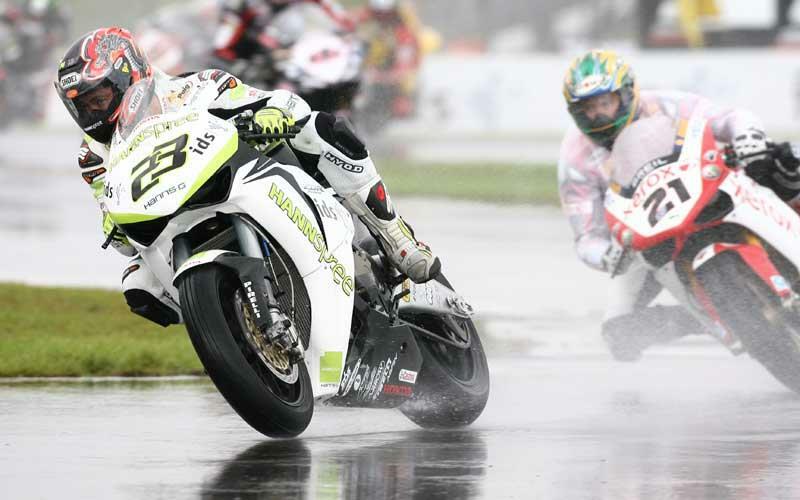 SUPERSTOCK 600: 1 M Bussolotti, Italy (Yamaha), 2 A Lowes, GB (Kawasaki), 3 G Rea, GB (Yamaha). British: 4 D Linfoot (Yamaha), 6 S Lowes, (Honda), 8 L Johnston (Honda), 11 J Burns (Yamaha), 16 R Stewart (Triumph). Championship points: 1 Baz 146pts, 2 Vostarek 121, 3 Bussolotti 107. British: 4 Rea 97, 5 Linfoot 87, 10 Black 45, 14 A Lowes 20, 16 S Lowes 17, 21 Johnston 8, 27 Paton 7, 28 Hunt 6, 29 Burns 5, 37 Hamilton and Grant 1. First 125 Aprilia (8 laps – 12 miles): 1 D Murphy 10:38.83 – 68.16mph, 2 N Glasgow, 3 J Cunningham. FL: Glasgow 1:17.27 – 70.44mph. Second (8 laps): 1 J Loughlin 10:37.57 – 68.30mph, 2 Murphy, 3 Glasgow. FL: Loughlin 1:17.56 – 70.18mph. First 125 (8 laps): 1 S Wilson 9:37.69 – 75.37mph, 2 A Irwin, 3 R English (all Hon). FL: Wilson 1:10.27 – 77.46mph. Second (8 laps): 1 Wilson 9:29.45 – 76.49mph, 2 Irwin, 3 R Glasgow (Hon). FL: Glasgow 1:09.61 – 78.19mph. First pre-97: 1 J Higginson 11:45.73 – 77.13mph, 2 D O’Dwyer, 3 S Thompson (all Hon). FL: Higginson 1:08.10 – 79.92mph. Second: 1 Higginson 11:38.00 – 77.98mph, 2 O’Dwyer, 3 Thompson. FL: Higginson 1:08.02 – 80.02mph. First 600: 1 P Erwin (Hon) 11:05.64 – 81.77mph, 2 A Hill (Yam), 3 C Nally (Yam). FL: Erwin 1:05.17 – 85.53mph. Second: 1 G Keys (Yam) 11:10.52 – 81.18mph, 2 Nally, 3 Erwin. FL: Nally 1:05.11 – 83.60mph. First 1010: 1 B Smith (Suz) 11:00.58 – 82.40mph, 2 C Thompson (Suz), 3 M McKinney (Kaw). FL: Smith 1:03.71 – 85.43mph. Second: 1 Thompson 11:05.89 – 81.74mph, 2 Smith, 3 McKinney. FL: Thompson 1:04.74 – 84.08mph. First classic (8 laps): 1 J Conroy (Hon) 10:34.34 – 68.64mph, 2 B Rapple (Wes), 3 A Conroy (Hon). FL: J Conroy 1:17.68 – 70.07mph. Second (3 laps – 4.5 miles): 1 A Conroy 4:39.65 – 58.39mph, 2 J Conroy, 3 D Crawford (Hon). FL: Crawford 1:30.65 – 60.04mph. First F125: 1 John McPhee 8:55.369, 2 Ewan Gray, 3 Andrew Tasker (all Apr). Second: 1 McPhee 8:53.018, 2 Gray, 3 Tasker. First GP125 (6 laps):1 Adam Blacklock 6:55.287, 2 Matthew Paulo (all Hon). Second: 1 Paulo 8:17.925, 2 Blacklock. First classic: 1 Mark McGaw (Wes) 10:06.472, 2 Robert Grey (Hon), 3 Gordon. Brown (Hon). Second: 1 McGaw 9:47.483, 2 Grey, 3 Iain Bell. First F400 (6 laps): 1 Roy Houston (Yam) 6:35.362, 2 Vic Allan (Kaw), 3 Scott Hamilton (Apr). Second: 1 Houston 8:11.800, 2 Sandy Berwick (Hon), 3 Hamilton. First Minitwins (6 laps): 1 Rab Davie (Hyosung) 6:16.753, 2 Mike Lawson (Kaw), 3 Cameron Wilson (Suz). Second: 1 Davie 7:50.000, 2 Lawson, 3 Wilson. First 400 Sports Production (7 laps): 1 Neil Hose (Kaw) 7:08.447, 2 Tom Robinson (Hon), 3 Paul Christie (Kaw). Second: 1 Hose 8:16.858, 2 Christie, 3 Colin Murray (Kaw). First 600 Production (10 laps): 1 Michael Robertson (Suz) 9:54.316, 2 Bryan Duncanson (Suz), 3 Brian Thom (Hon). Second: 1 Robertson 9:32.478, 2 Ryan Gibb (Suz), 3 Mike Skinner (Yam). First Superstock (10 laps): 1 Michael Robertson (Suz) 9:31.158, 2 Torquil Paterson (Suz), 3 Adrian Clark (Kaw). Second (10 laps): 1 Paterson 8:38.731, 2 Bruce Birnie (Suz), 3 Bob Grant (Yam). First Scottish Championship Supersort 600 (10 laps): 1 Lewis Farrow (Yam) 9:44.590, 2 Kenny Edwards (Suz), 3 Jason Blacklock (Hon). Second (10 laps): 1 Farrow 8:53.937, 2 John MacDonald, 3 Edwards. First sidecars: 1 Scott Lawrie/James Connell 8:25.443, 2 Bill/Graeme Davie, 3 Gordon Shand/Tony Belsey (all Suz). Second (6 laps): 1 Davie 5:40.005, 2 Lawrie, 3 David Wrinn/Erich Schonwalder (Suz). 1 Graham Jarvis (She) 80, 2 Michael Brown (Bet) 115, 3haun Morris (Gas) 123, 4 Alexz Wigg (Mon) 123, 5 Ross Danby (Gas) 150, 6 Sam Haslam (Gas) 102. Championship points: 1 Brown 102, 2 Jarvis 101, 3 Morris 92, 4 Wigg 69, 5 Haslam 62, 6 Danby 61. In memory of Tim Johnson who was killed racing in 2005, his widow was at British Historic Racing at Lydden circuit on Sunday, 31 August to invest the three top place riders in the solo and sidecar champion of champions handicaps with a special medal to commemorate his death. They were Solo: 1 S Harris (Duc), 2 D Hewlett (Duc), 3 P Potter (BSA). Three wheeeler; 1 K Williams/J Wilson (600 Tri), 2 S/B Hutchinson (Berkeley), 3 S Ormrod/A Blacklock (Berkeley).